As the leading birth photographer in Minneapolis and St. Paul, I am honored to bear witness to incredible transformations on a weekly basis. I document raw beauty, pure strength, and authentic love. This birth was no exception. When Helena reached out to me way back in August about having the birth of her sweet Nina photographed, I was thrilled. As April approached, she decided to add videography on to her package and I was so excited to be able to capture even more of her birth story. Helena's baby would be born via a gestational carrier (GC), a wonderful woman who was as excited about having the birth documented as we were. As their guess date approached, little Nina showed a bit of her personality by teasing her GC and her parents with start and stop contractions for over a week. Finally, in the early hours of April 13th, the contractions became too much to deal with at home and we all met up at United Hospital in St. Paul, Minnesota. Nina's GC has a history of fast labors. When I arrived at the hospital at 4 am, I half-expected to meet sweet Nina within minutes -- and not just because of her GC’s history but also because a few recent babies had been in such a rush to join us that I only got to spend a short while with their mamas before capturing their moment of birth. This time around, things went a bit slower. An epidural... a bit of pitocin... and then they decided to break the GC's bag of waters (called AROM or artificial rupture of membranes). That kicked things into high gear and baby was born just a half an hour later, after only two pushes. I just adore the sweet looks on her parent's faces as they witnessed her birth. And the moment shared between the amazing gestational carrier and Nina's incredible mama... so touching! I hope you enjoy looking at this sneak peek into Nina's birth as much as I enjoyed capturing it. 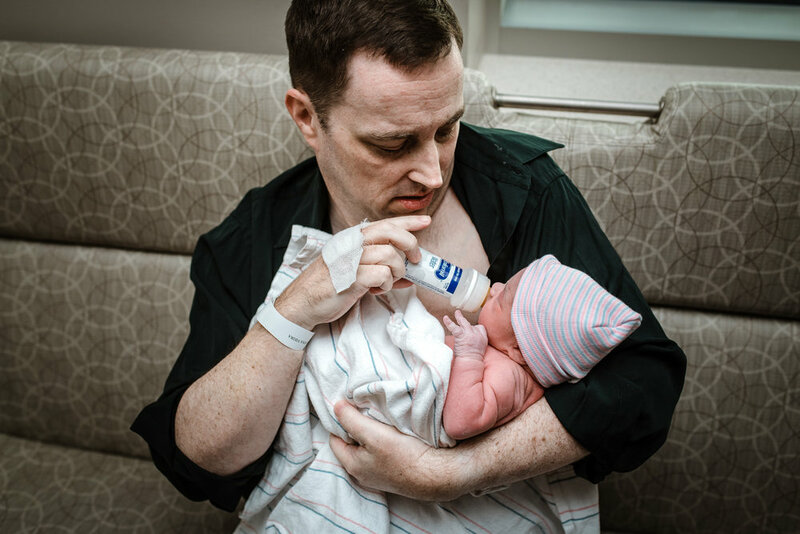 Interested in learning more about Meredith’s birth photography services in Minneapolis?